This 44BX was purchased from the owner of a radio station who was an engineer and told us he purchased the microphone new. We sent the microphone to Wes Dooley to check over and replace the ribbon even though our audio check of the microphone sounded very good. 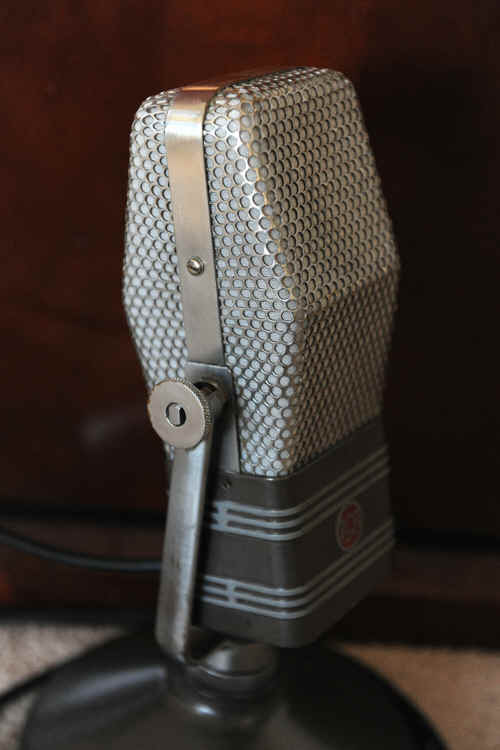 These RCA 44BXs have a very smooth sound which is characteristic of a ribbon microphone. They were used almost exclusively for dramatic programs in that they have a figure eight pick up pattern so actors can stand on both sides of the microphone. They were also designed for live music pickup because of the excellent bass response. For voice, the microphone is designed to be worked no closer than 6 to 12 inches. To speak closer tends to give an overly bassy sound on voice as would most any ribbon microphone. The bottom of the base has a cover which can be easily removed with four small screws. A jumper can be positioned which provides for attenuation of low frequencies. It is known as the Voice and Music positions. For voice work we always use the microphones in the Voice position and this 44 BX is so wired. However, you can change it to the Music position in minutes. This microphone comes with a dust cover and carrying-shipping case. Click on the microphone for details and more pictures or click HERE or the picture above.